My kitchen was looking drab. I haven’t replaced any kitchen linens in years, and frankly my oven mitts and tea towels were a bit on the embarrassing side. I’m going to show you a picture, and you’ll know why these items have not previously appeared in any posts!! Yech. Horrible! Don’t laugh. It could happen to anyone. They poke at me, pester me, and generally make a nuisance of themselves until I do something about it. Once the kitchen linens were on my radar, the results were inevitable. It had to be done. So I turned up some Gimme Gimmes and got to it. I’ve been doing quite a bit of sewing lately, and the two ideas began to intersect at the back of my mind. I rummaged through my stack (- ok – it’s a closet – I keep everything!) of unwearable clothing, old towels & sheets, scraps of fabric and other assorted recycleable (read: craft) items and came up with a pair of never worn fatigue-green cotton pants, a large scrap of some grey fabric and an old white towel. I don’t have any thermal batting , I wasn’t sure using a towel would be sufficient as far as heat protection; but my quickly forming plan was beginning to take shape, so I decided to give it a try figuring that if they didn’t work as oven mitts, they would at least work as photo props!! First, I soaked the towel in some Oxiclean for a few hours – that stuff does wonders(!) and the towel looked bright and white again. I wish I’d gotten decent before pictures; this was a towel I meant to tear up for rags!! I can follow patterns, but I’m the type of person who doesn’t. :D I just start cutting and putting things together until I like it, then I sew it all up!! Sometimes I mark and measure. Other times I just go by eye. I am more of a brute force crafter than a meticulous by the book stickler type. I am more of a brute force crafter than a meticulous by the book stickler type. I definitely wanted to use the printed part of the pants for a design feature, so chopping that off was first on the list. I placed an old mitt over the area and left plenty of allowance while “tracing” the rough shape with a tailors pen . To get the print, I had to incorporate the existing seams into the design, so I decided I may as well also keep the hemmed edges for my cuffs. I traced roughly 3/4″ allowance around the outside of the old yucky oven mitt and cut out the rough area for the new mitts. After playing with the different fabrics together, I cut wide strips of grey fabric and removed the bottom hem of the green fabric. I stitched them together into my pattern before pinning 2 of the glove shapes onto doubled towel material and cutting it out. So all together, I had 4 of each. I used the grey fabric to create a little hanger; which I couldn’t convince to pull through itself. Rather than remaking them, I left the stitching on the outside as part of the design. Then I sewed the towel pieces onto each glove piece. Everything got pinned together, sewn up and turned out. I love them! I had a chance to test them out a couple hours later while making dinner, and I found them more heat resistant then my old battered oven mitts, so the experiment was a success!! And I now have some cute custom oven mitts!! Dinner baked at 350, the real test will be when I make bread at 500F! Of course the new mitts made the tea towels look shabby; so I couldn’t quit now, I still had plenty of fabric! I wouldn’t mind owning a couple of hot pads either. Why not? I made the whole set!! Although…I could still use a bread bag and a straining bag – ooh and an apron. Hmm. I’ll let that percolate in the brain box for a few days. I made one extra long hot pad – never owned one like it before. I originally planned to quilt the whole thing together, but after turning it out, I decided not to close it up. So it kind of reminds me of a wine bag or something. Hi Katherine:) You know I show up every week!! Thanks for stopping by! How creative! Thank you for sharing at the Thursday Favorite Things Blog Hop! I like that you are a “fly by seat of your pants” kind of seamstress. Nice pun! Did you put the 3 layers together by first placing the 2 green pieces right sides together, then adding the towel layer, then sewing around the edges? You didn’t say at that step. I learned that method of sewing 3 layers many years ago. I had completely forgotten until I recently saw someone’s post on Pinterest on sewing pot holders. Thanks to Pinterest I have my creative brain turned back on! Thanks too for your tute. I pinned each green piece to the towel separately and cut the towel to size that way. Then the towel pieces (still pinned on after trimming) were sewn onto each green piece. Then place the two sides of the glove, right sides together – don’t forget the hanger – pin, and sew it all up. One thing I had forgotten after quite some time of not needing it – if you’re sewing a few layers and it’s too thick to fit under the presser foot; the foot actually lifts higher using the same lever as usual. I hadn’t needed it in so long I’d completely forgotten the feature was available! @Adriana. I think the problem might be Hometalk, because I tried several times to send a couple of posts yesterday and they just wouldn’t ‘take’. Also there are are no #s above to click to see previous posts, so can’t see the reply you sent to me. Morning Linda:) I made my sourdough bread yesterday evening at 475F, and the one layer of towel held up for me. It’s hard to say what will work for you because your fabric and towel may be very different from mine. You could do a search on Amazon (or wherever you prefer) for Insulbrite or thermal batting. 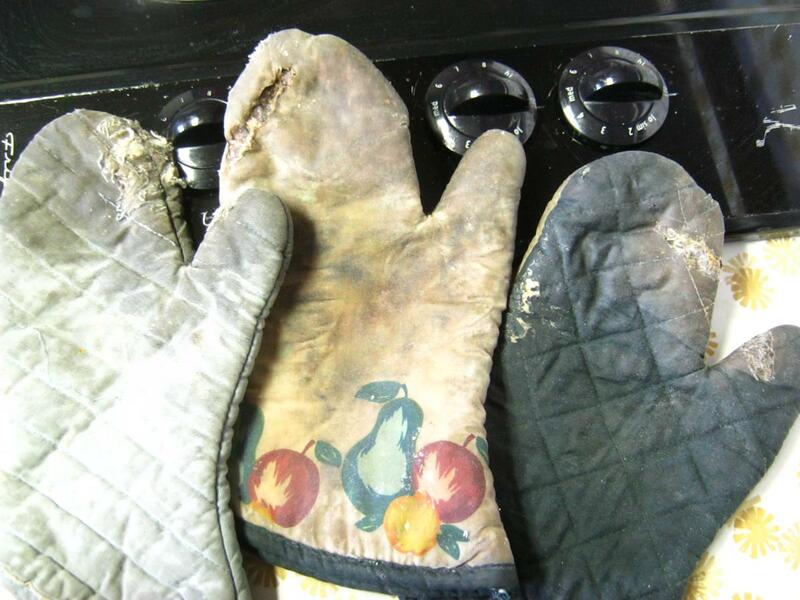 Those are the recommended materials for making oven mitts heat resistant. I replied: I used only 1 layer of towel per side. I didn’t have a problem at 350F, but haven’t tried higher temps yet. I have a preferment ready for sourdough for tomorrow (500F) – I’ll definitely let you know how it goes. I love upcycling- and this is a great idea! Will have to pin for later! This is brilliant! And, so stylish. Love it. What a great idea! I love it! I’m really into reusing old clothing. Thanks for sharing and the idea! Thanks Dale! I try to reuse as much as possible around the house. Even if the clothes are completely worn out, they make good rags for working on vehicles, cleaning, or even broken down far enough to use the fibers in paper making/paper mache. I LOVE what you’ve done here! How creative and imaginative you are! The cammo attire for the kitchen is the best! Well done!!! My mother-in-law is way more crafty than I am and I showed her this post. I asked to help me in making these. Love ’em! Oh, that’s so cool. Thanks Alina! this is such a cool idea! my husband has plenty of clothes we could make this with and he would love it! Thanks Amanda! Have fun with it! I love that you re-used your “army fatigues” for a new purpose! This is exactly something I would do! Creative thinking going on here!!! You should start a new business for making these, and selling them!! You know how many men would buy these for their BBQ!!! I really think that you should start a sub-business creating these cammo BBQ items!!! Seriously, I really think people would buy them!! !